Because I’m from Dallas, people sometimes ask me to name the greatest movie ever filmed in Dallas. I always answer Bottle Rocket, not just because Wes Anderson’s 1996 debut is of great professional significance to me—I was the first critic ever to review one of his movies, specifically the black-and-white short film version, which played the USA Film Festival in 1994, and I’ve been writing an ongoing series about his work titled The Wes Anderson Collection—but because, from the instant I popped the VHS screener into my VCR in my apartment on Cabell Drive, near CityPlace, I realized that Anderson was showing the city in a uniquely personal and artful way. If you go back and watch that original short again—viewable on YouTube as well as DVD—you’ll see what I mean. From the opening scene of petty thieves Anthony (Luke Wilson) and Dignan (co-writer Owen Wilson) walking through the lush commons of Greenway Parks en route to a burglary, Anderson showed an appreciation for architecture, light, and space. There was something enchanting about the way the film looked and felt. It had jump cuts and was partly scored with jazz, including “Skating,” from Vince Guaraldi’s score for A Charlie Brown Christmas, which played as Dignan, Anthony, and Robert Musgrave’s Bob went target shooting in a field. Sunlight streamed through windows and lit the sides of actors’ faces in the manner of 1960s fashion magazine photography. I remember thinking that if I were living in a small Texas town, this short film might inspire me to move to Dallas. I also remember thinking that it somehow felt French. I must confess that growing up I’d never thought of Dallas as a beautiful city, though it had some beautiful places. Mostly I thought of it as a flat place with a lot of malls and chain stores, looming and often obnoxiously glittery skyscrapers, and so many roads and highways that, at times, it could feel like a city of cars that just happened to tolerate people. It was only when I talked to Anderson not long after watching the short for the first time that I learned one of his favorite movies is Francois Truffaut’s debut film, 1959’s coming-of-age drama The 400 Blows, which is shot in widescreen black-and-white and takes a similarly intoxicated view of its setting. What Anderson had done was treat Dallas as if it were Paris, and the strange offhandedness of that decision only added to the magic. That magic was apparent when the short screened at the USA Film Festival. You could hear murmurs of recognition and appreciation every time the film shifted location, from Greenway Parks to downtown Grand Prairie (where a scene of Anthony and Dignan critiquing their burglary and then playing pinball was shot at Millar Drug) and the interiors of local homes and apartments. The feature version of Bottle Rocket, shot on 35mm color film, was even more lovely and embellished Anderson’s vision of Dallas as City of Enchantment. Anderson’s director of photography, Robert Yeoman—who would go on to shoot six more Wes Anderson features, including the multiple Oscar-nominated The Grand Budapest Hotel—kept still-frame images from Bernardo Bertolucci’s 1970 thriller The Conformist next to his viewfinder as a reference. That says a lot in itself. Shot on location in Rome and Paris by cinematographer Vittorio Storaro (Apocalypse Now), The Conformist is widely considered one of the most sensuously photographed films ever made. Anderson wanted the crew to keep it in mind whether they were shooting locations as intrinsically lovely as the Frank Lloyd Wright-designed John Gillin Residence in North Dallas, as imposing as the Hinckley Cold Storage facility (now the Texas Ice House) in Deep Ellum, or as nondescript as the now-long-gone Bookstop at NorthPark. The headquarters of Mr. Henry (James Caan), the boys’ hepcat mentor, was just a warehouse with a peeling facade, three blocks east of the White Swan building on Lamar. But it was lit and filmed in a way that made it look mysterious, even luminous. Once you went inside to attend one of Mr. Henry’s parties, things became even more funky-cosmopolitan, with elegantly or oddly dressed hipster types milling about and Caan, now top-knotted like a Kurosawa samurai, holding court in a kimono and sandals with white socks, a stuffed ocelot perched on his shoulder. Few films or TV shows have made Dallas look so fascinating. Few, for that matter, have shown Dallas as Dallas, much less used it as a springboard for stories of real imagination. I’ve seen a few good movies that used Dallas as Dallas (notably Oliver Stone’s Talk Radio and JFK, and Robert Altman’s Dr. T and the Women, a satire of North Dallas society that includes a grimly funny yet harrowing scene of Farrah Fawcett splashing around in a fountain at NorthPark). I’ve seen projects that purported to be set here but didn’t seem terribly interested in the visual character of the actual, physical city—most famously the two incarnations of TV’s Dallas, only the second of which was mainly filmed in North Texas. Once in a very great while, you see something filmed in Dallas that seems really connected to it, such as Shane Carruth’s Primer, which never came right out and said where it was taking place but captured an ineffable truth about the icy blue-greenness of the high-tech suburbs around the city. I’ve seen films and TV shows that used Dallas as a stand-in for someplace else, such as the science fiction films Logan’s Run (1976), The Lathe of Heaven (1980), and RoboCop (1987), where the more coldly Brutalist parts of the city stood in for Washington, D.C.; Portland; and Detroit. 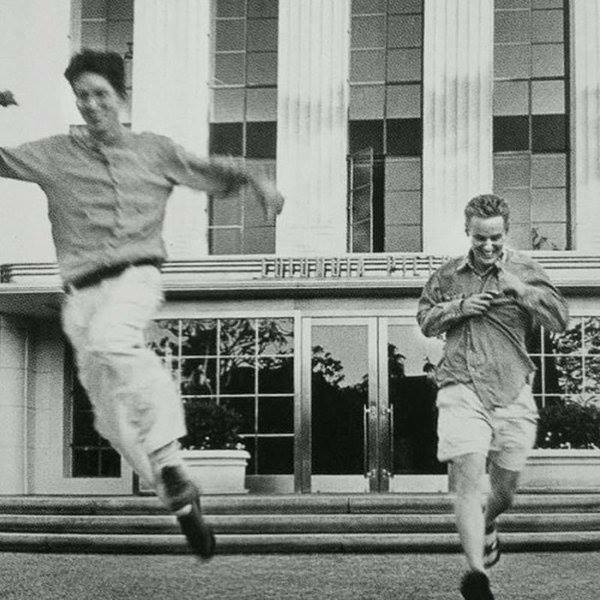 But Bottle Rocket is the first and only production I’ve seen where the city seems to truly inspire the filmmakers, in an entirely positive sense. Watching it, you don’t feel as though the filmmakers are working out issues or simply making the best of the city that’s in front of them. You feel as though you’re reading a love letter written on celluloid. There was a point, Anderson later said, where he and a rotating cast of would-be Dallas filmmakers and actors were all living together in a small apartment on Throckmorton Street. Bottle Rocket executive producer James L. Brooks referred to it as a flophouse. They videotaped auditions in the parking lot behind the apartment building. And they spent a lot of time at Cosmic Cup (now Cosmic Cafe). That’s where they met two future members of Anderson’s repertory company, Kumar Pallana (of four Wes Anderson films, including Bottle Rocket, in which he costarred as the safe-cracker Kumar) and Kumar’s son Dipak (who would go on to play a doctor who examines the father in The Royal Tenenbaums, the math teacher who dares the hero of Rushmore to solve the hardest geometry equation in the world, and the Bookstop manager in Bottle Rocket who asks Dignan why he and Anthony have tape on their noses). Ultimately, the lyrical sensibility of Bottle Rocket probably has more to do with Anderson and the Wilson brothers’ youth—the sense that, despite the tedium of daily lives, their futures still held tremendous promise, and one could never know where the future might take them. As a Dallas Observer critic, I covered the making of the feature version of Bottle Rocket from start to finish, including preproduction, location shooting, editing (which took place in Los Angeles), and the disappointing run-up to the film’s release in February 1996. (It was intended as a fall 1995 release until it got a disastrous reaction in test screenings, and Columbia Pictures decided to dump it.) I watched them shoot key scenes, including the stuff at the Frank Lloyd Wright house; that sweet moment at St. Mark’s between Anthony and his kid sister (“You’ve never worked a day in your life. How can you be exhausted?”); a scene filmed in the main dining area at Brookhaven Country Club, where Mr. Henry stands up to Bob’s bullying older brother, Future Man (Andrew Wilson); and the warehouse party. At every point, I was struck by how relaxed and confident Anderson, his actors, and his crew seemed, as if they already had thought through their vision and were simply executing it, in the manner of old pros rather than newcomers whose careers could be made or broken by the work’s reception. The finished feature confirmed my initial reaction, even though the plot was trifling, and the love story between Anthony and a motel maid (Lumi Cavazos), filmed at the former Windmill Inn in Hillsboro, sagged a bit. From little production design and costuming touches, such as Bob the wheelman’s black suits and wide-tipped collars, to its pop art-inflected panoramas of city streets and desolate stretches of interstate highway, to its expressive use of slow motion and deep-cut rock and roll (The Rolling Stones’ “2000 Man” was a highlight), Bottle Rocket displayed a laid-back elegance that is still rare in first features. It impressed without straining to impress. The thing they all have in common, beyond the obvious stylistic and thematic commonalities, is that they all take reality and turn it into something else. The Dallas of Bottle Rocket is very clearly and rather proudly Dallas—much more so than the Houston of Rushmore, which at times seems as though it could just as easily be a suburb of Chicago—yet at the same time it’s also an idea of Dallas, an imaginative space where things can happen to the characters as the filmmakers express a certain view of life. In that sense, Bottle Rocket belongs to the same tradition, locationally speaking, as the New York of Sweet Smell of Success or Manhattan or Taxi Driver; or the Los Angeles of Sunset Boulevard, The Long Goodbye, or Short Cuts; or Paris in Last Tango in Paris or The 400 Blows. It seems telling that the pinball scene in both the short and feature versions of Bottle Rocket is modeled, right down to the tight cutting and the use of close-ups, on a similar scene from The 400 Blows, yet Anderson shifted locations from the short to the feature (shooting the scene of Dignan and Anthony critiquing their breaking-and-entering work at the Highland Park Pharmacy in the feature, rather than returning to Millar Drug in Grand Prairie) and produced more or less the same effects (and with color this time). This suggests to me that Anderson’s world is mainly an interior one. It just happens to express itself by way of real-world locations (particularly in his earlier films) and fantastic sets that could be invented from the ground up or glommed onto existing structures (the latter approach defines The Life Aquatic, The Darjeeling Limited, Moonrise Kingdom, and The Grand Budapest Hotel). What we’re talking about here, in the end, is vision. As I’ve often said, there’s a big difference between style and vision. A style is a way of moving the camera, of staging and modulating the actors’ performances and so on—a set of characteristics, or “tells,” that identifies who was responsible for a movie. A vision is larger and more complex, even if the filmmaker is working a la Wes Anderson, in a simultaneously right- and left-brained way, fussing over sets, costumes, compositions, and design details, but letting the characters’ actions remain just a little bit mysterious, and ultimately caring more about the overall feeling of the work than any particular shot or scene. Anderson has never been inclined to analyze his choices too closely, not even with me—and I’ve done two installments in The Wes Anderson Collection, the second devoted entirely to The Grand Budapest Hotel. He’ll talk to you for quite a long time about how certain sets were built; or about how he composes close-ups when he’s shooting in CinemaScope; or how he and his team faked a “train ride” in The Grand Budapest Hotel by building a facade of a train’s interior, pointing the camera out through a “window,” and having dolly grips push it very quickly on tracks across a snowy stretch of Austro-Hungarian snow while star Ralph Fiennes held his breath so you wouldn’t see the plumes of frost and realize Anderson had fooled you. But if you burrow too deeply into why things look as they do, you can sense him starting to withdraw, at which point the “hmms” and shrugs come out. He doesn’t just want viewers to respect the mystery, he seems to want to respect his own mysteries, including the puzzle of why his films feel so overwhelmingly physical yet also so fanciful, and why he can point the camera at Dallas circa 1992 (the short film) or 1994 (the feature) and make it look almost like a fairytale landscape, or at the very least, like the sort of place where oddball characters can steal things, dream about implementing a “75-year plan,” fall in love, lose everything, and gain something else. Dallas is the place where it all started for him, as well as for the Wilson brothers. Maybe it’s best to leave it at that, and let the images speak for themselves. Matt Zoller Seitz is the television critic for New York magazine, the editor of RogerEbert.com, and the author of The Wes Anderson Collection (2013) and Wes Anderson Collection: The Grand Budapest Hotel (2015). Contact him on Twitter at @mattzollerseitz. You can read the original version of the article right here.